We decided to cook a duck today. We had never made it before because we thought it was difficult to make...wrong. We bought a whole duck and cooked it in a roasting pan just like a chicken. We first had to buy a roasting pan. Although our kitchen is very well equipped, a roasting pan was one of the few things we didn't have. We removed the innards and stuffed the duck with orange pieces and cilantro. Once the duck was cooked, we took it apart and separated the meat. We used the breasts in our supper tonight. 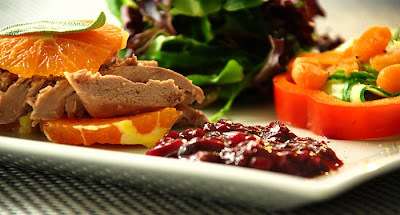 We made salad with a blueberry shallot compote and served the duck breast on orange slices. The only fat in this meal came from the duck so it was a very healthy meal. 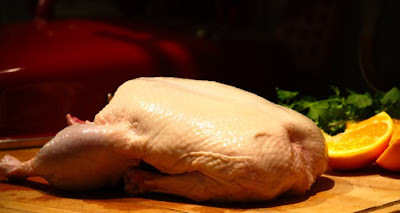 We then cooked a stock with the carcass and we are making duck pho (Vietnamese duck soup) tomorrow. To make the stock we added lemongrass and mirepoix (fancy French name for a combination of onions, carrots, and celery), garlic, the duck heart and neck. We will see the results tomorrow. Above is a picture of the really healthy meal we made with the duck breast tonight.